Introduced the Protestant religion to the country. Over the course of the period, there were many executions carried out on religious grounds. So, what was Henry VIII’s Religion? Henry had been brought up a Catholic; this was the religion of England and one that he was devoted to. King Henry VIII religion only changed when he was not able to get his own way, subsequently throwing the religion of the country into turmoil. 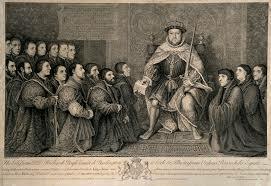 The main King Henry VIII Religion in England at the time was Catholicism, but many people were feeling oppressed by the Catholic Church, is bound to hand over goods and money to the church every month. The Reformation, brought about in England by Henry VIII released many people from the greedy clutches of the church and allowed them to enjoy their religion in a way that was not costly to their livelihoods. There were a number of differences between the old and the new religion. The services were different as well as the format of the Bible that was used in services. The priests had different roles and responsibilities, and in the Church of England, priests were, on the most part, allowed to marry. The classification of sins was different, as was the style and decoration of the churches. One of the main differences was that where all of the services that were carried out in Catholic churches, were conducted in Latin; the Church of England conducted its services in the language of the people. The common man could now better understand the word of God. Changing the language of the services made religion less elite, and more open to all. Tudor Catholics believed that God himself had ordained the Pope and that the Catholic priests in their communities where a direct link between themselves and God. These priests were seen as devoted to god with no diversions such as marriage and children allowed to take them from their work. Protestant ministers were ordinary people, they required no ostentatious robes. They lead ordinary lives, had wives and children and had a better understanding of the life and religious needs of the common man. For Tudor Catholics that had committed a sin, they believed that only the priest, the pope or God himself could forgive them; though this forgiveness came at a price. Gifts were presented to priests in order that an individual’s sins could be absolved. Protestants, however, believed that only God had the power to forgive sin and that no bribery would see then absolved in their lifetime. Catholic churches were highly decorated and filled with idols, believing that God in all his glory should be celebrated as much as possible. Protestant churches were plain and simple; it was thought that without elaborate and ornate diversions the congregation would be better able to concentrate on the sermon being delivered to them.